Grab yourself a cuppa and get comfy, because there’s no swift way of explaining how and where to find tenders in the UK. What to do once you find them can also be a little complex if you haven’t done it much before. I’ve been writing and scrapping this post for about three years; let’s hope today I can finally put it together in a way that’s clear, if not concise. Public sector/publicly funded organisations are obligated to follow certain rules around the publication of tenders and management of the tender process. Private businesses are not obligated to follow these rules and, while they may decide to do things in a similar way for (their) ease, they don’t have to follow the rules to the letter. This post therefore deals mainly with the public sector. Even within the public sector there are some thresholds and other elements that allow certain types of organisations to by-pass the tender process or use a modified one. Therefore the following information relates broadly to expected norms, with the understanding that individual cases may be different. Any lists of resources in this post should not be considered as ‘exhaustive’; rules within rules and clauses within clauses mean that sometimes, some tenders aren’t where you’d think they should be. But they are usually where they must be. By ‘freely accessible’, I mean you shouldn’t actually need to pay to get access to tender documents. But it can be costly in other ways once you consider how much of your own time you’ll need to put into both the searching-for and registering-for process. If you google ‘how to find tenders’ you’ll generate a list as long as your arm of companies that will find them for you *for a fee*. Some of these are more expensive than others and you tend to get what you pay for. They’re certainly a reasonable option, particularly if you’re looking either for one or two very specific, probably high value tenders per year or you want to find and go for numerous tenders every month. It’s absolutely an option worthy of consideration, especially if your time is limited. If using a tender alert service just isn’t in your budget, there are tons of places online where tenders are published but it can take a bit of legwork to find the right ones for you. The majority of public sector tenders over a certain value must be advertised and the ad needs to be ‘publicly available’. The value and nature of the contract determines where those ads must go. TED (Tenders Electronic Daily) – TED publishes all notices advertised in the Official Journal of the European Union (OJEU). Contracting authorities must abide by strict rules whereby all contracts over a certain value must be published here regardless of whether they are published anywhere else or not. The thresholds for contract type are revised annually but a broad rule of thumb is ‘contracts over £100k’ (although ‘small lots’ have a thresholds of around £60k). Contracts Finder – This is a UK Government website, which lists contracts over £10k. It also links to additional, similar sites for Scotland, Wales and Northern Ireland but doesn’t claim to be solely for England, so there may be some cross-over. Contract notices can also be found on the websites of individual organisations, government agencies and through procurement portals. I’ve put together a list at the end of this post. My Guide to TED explains what the different types of search terms are and how you can use them to narrow down your search so that you only see contract notices that are of interest to you. The guide is TED-specific but a lot of the terminology, e.g. CPV codes, is used across the procurement world. Once you’ve had a rummage through TED or Contracts Finder or any of the numerous procurement portals, it’s wise to save your search parameters and set up email alerts for future tenders so that you don’t have to keep going back and searching through each of them every few days. This is essentially what paid-for tender alerts services do on your behalf to a greater or lesser extent. There are a few formal rules, as well as a few informal expectations, about what gets published where, so it’s handy to figure out how those affect your business specifically and, subsequently, where you’re most likely to find the type of tenders that are suitable for you. Creating a comprehensive ‘bid/no bid’ strategy will help you narrow down what you need to be searching for and save you looking for a needle in a haystack of unsuitable tenders. For example: Are you only looking for contracts in your local region? Do you only supply to the NHS? What contract value are you looking for? Do you want only direct service contracts or would you be happy on a framework? Understanding all of these things will help you streamline and structure your searches so that you can quickly sift through ‘definites’, ‘possibles’ and ‘absolutely nots’. When you sign up for alerts on TED, Contracts Finder or with a tender alert service, the information you’ll receive will be pretty basic, usually in the form of a contract notice, which is just a formal notification that the tender process for a specific contract is underway. However, a contract notice is not the full story and, in the vast majority of cases, you can’t respond to a tender via that notice alone. To go any further, you’ll need to register as a supplier to be able to request the full set of tender documents – including all the instructions, specifications, forms and questionnaires you’ll need to read, complete and submit – from the relevant contracting authority. When you register as a supplier with an organisation, government agency or procurement portal, you’ll be asked for more specific detail about your company. You can then request access to the tender documents for that contract. You can also register as a supplier in advance with many organisations, agencies and procurement portals and sign up for alerts specifically from them. Something to note – when you do register as a supplier, it needs to be done by someone at your company. You can’t easily out-source this bit to an individual bid writer or a tender services company as it’s vital that any contact info is specific to your company. The email address you supply will be the one that gets the alerts and any correspondence about tenders-in progress; it may also form part of any contracts you win. You can give temporary access to a trusted entity outside your company if you need to (e.g. to allow your bid writer to access tender documents or submit a bid on your behalf) but the responsibility for and authority over that access absolutely needs to remain with you. Signing up for alerts first Vs registering as a supplier first: which is best? Neither really. A bit of both? 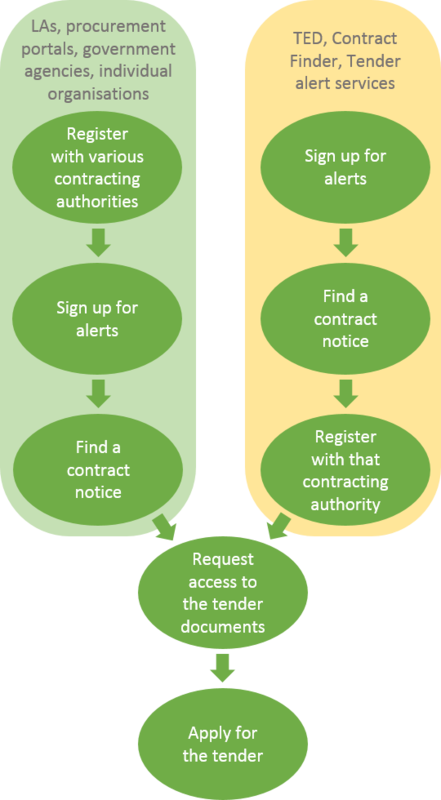 One way or another, you’re ultimately going to need to register to request access to the tender documents from whichever contracting authority is running the tender process. Superficially, whether you get to that point via a basic alerts service or because you’re already registered as a supplier with that contracting authority doesn’t really matter. If you’re only looking for contracts in a particular sector, e.g. not for profit, or in a specific region, then registering as a supplier and signing up for alerts with the various portals dedicated to those might be the best way to go. If you’re able to supply to every sector in every region, then signing up for basic contract notice alerts through TED and Contracts Finder might be better for you. It all depends on how wide you want to cast your net and what you plan to catch with it. Depending on the contract value and a few other specifics, it’s likely that in many cases you’d be able to find the same tender via both routes. Determining which route works best for you, day to day, is really just an exercise in efficiency. I add to this list whenever I come across another portal while I’m working on a client’s bid or when I see a new regional procurement partnership has sprung up or the government splits or combines its various agencies. It’s an ever-ongoing thing. If you know about a portal I’ve not listed, do let me know in the comments! Some portals are directly managed by local authorities and councils, some are procurement partnerships across regions and/or sectors, some are purchasing organisations (outside agencies running procurement for member organisations) and some are regional business support organisations who may offer tender opportunities as well as wider business support (SMEs particularly). There are 39 regional business growth hubs. You can find your region’s hub via the map at the above link. Some hubs have an area on their site specifically for tenders; if your hub doesn’t, try searching for ‘tender’ or ‘opportunities’ in the search bar. If you know of another portal not listed here, let me know in the comments and I’ll add it in – thanks! Bid writing training vs coaching: which is best for you and your staff?